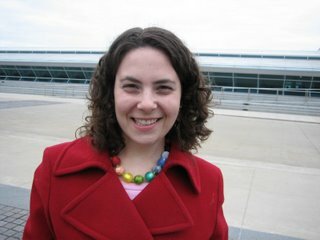 Julie Fortenberry of Children’s Illustration (although I’m confused, I thought it was “Picture Book Illustration” and typed it that way on my blogroll — help!) 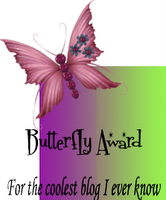 was kind enough to pass along to me the Butterfly Award. Thanks, Julie. Boy, this thing’s heavy! First, to Nan Hoekstra, who usually hangs out at Anokaberry Annotated. Nan is a special person to me, and she’s come to represent in my mind all that is good and great about the kidlitosphere. Nan works as a Youth Services Librarian in the middle of the wild tundra, as far as I can tell. And she loves books. Loves them passionately, loves them with all her heart. So she started a little blog back in February of 2008. Nothing fancy, just some lady talking about books if anybody cares to listen. This year, Nan made some changes with Anokaberry, turning it into Anokaberry Annotated. She promises to inject more of herself into it, and so far, so good. Nan was pretty much the first reader here at Jamespreller. She’s been very kind to me. We root for each other across the vast frozen distance. Check her out. Nan’s got soul. The second Butterfly goes to author Julie Halpern, who has been slogging away in the hot, sweaty Blog Pits for three years now. I read Julie’s novel, Get Well Soon, and immediately fell in love with her voice. Julie is married to my cyberworld brother, the gifted but challenging Matthew Cordell (Mighty Casey); so, yes, it’s awkward. What I love about Julie is that she’s a pop culture maniac, that she loves Paul Feig and Milk Duds and Lynda Barry and the Ramones, and that she’s a librarian and a brand new mom. Julie hasn’t been blogging as regularly lately — that new baby thing, causing upheaval — but hopefully this will goad Julie back into making an appearance. I miss her voice. One of these days Matthew and Julie and Romy and I are all going to find ourselves in one place — it will probably be a diner, I’m guessing — and what a great day that will be. 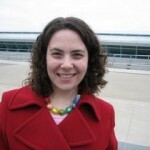 In the meantime, check out Julie’s Blog of Wonder. She’s something else. A bona fide Righteous Babe, and a hell of a writer, too.